Cumberland First Baptist Church is a community of faith united in exploring what it means to follow the way of Jesus Christ, to be a people of God and to love and care for our neighbors and the whole created order. As a church we will recognize no circles of exclusion, no walls that separate, no no boundaries that can't be crossed and no loyalties above those which we owe to God. All are welcome to join the journey! Cumberland is a community devoted to transformative expressions of life, lived in Jesus' name! The Bible, while our sourcebook, is not a recipe book for life. Pat answers no longer satisfy. We know life is more complex than sound bites. To read the Bible is to make meaning through interpretation. Just like our lives, the Bible carries multiple meanings and won't be reduced to stale doctrines. Religious diversity surrounds us like never before, crying out for open interfaith dialogue about common lived values and experiences. While grounded in a rich tradition of community and American Baptist life, Cumberland is a church energetically engaged in reformulating faith's questions and living fresh answers to them. A progressive people, we relish new ideas and new ways to express them. We embrace all members of our family as ministers of the church, and strive to equip them for witness and service in the world. 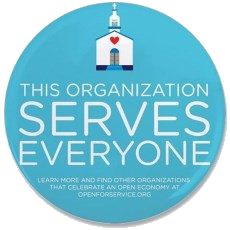 We are fervent in our commitment to diversity, whether of race, gender, ethnicity, or sexual orientation.